For Samuel's birthday, he was looking for a Jonathan Park adventure. He requested a visit to a cave on Saturday. To extend the fun a little, Pa had planned on getting a new tent and camping out with the boys. 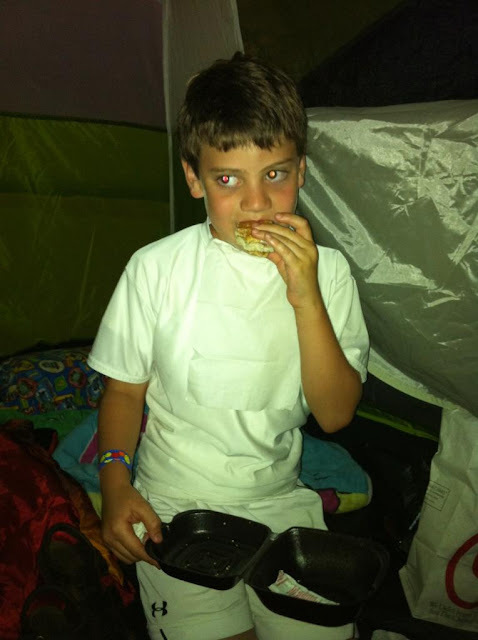 A few days before his birthday, we were at Chick-fil-A talking with our friendly manager when he told us about a special father and son camp out he had scheduled for the upcoming weekend. Pa knew instantly it was just the thing called for when considering a six year old boy's birthday adventure. 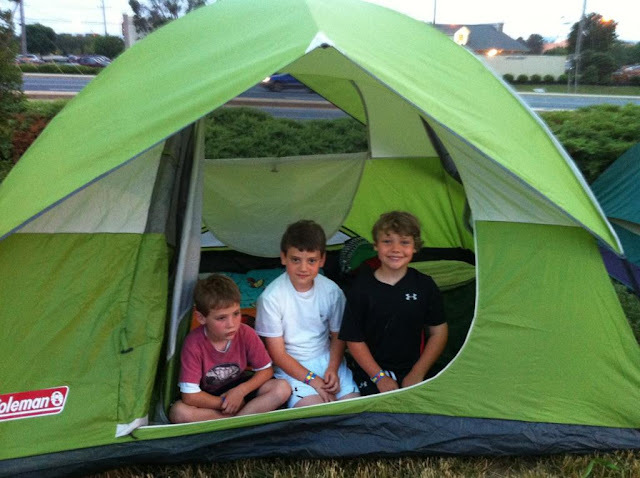 From my perspective, I have to say, only men would think of camping out at Chick-fil-A! Friday evening, we waved from the hill as our men headed out in the great outdoors. Step one accomplished, they got the tent up... and without Ellie directing, too! They were really roughing it. 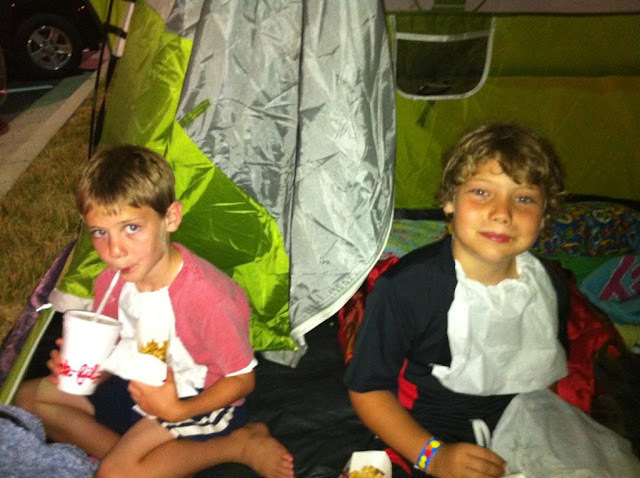 Not quite the same as catching some fish and cooking them over an open fire, but sandwiches, fries and lemonade from Chick-fil-A was the menu of the night. I love that my boys were thoughtful not to get ketchup on their clothes... in the wild. Next, was the rock climbing wall. The boys have never done this before, so it was quite exciting to try it out. Samuel even went twice, so I am told. There were other fun and games throughout the evening. And then time to wind down with roasted marshmallows and milkshakes. And yet they still managed to go to sleep. Go figure. After a good night sleep, everyone is ready to head home before starting off on a new adventure for the day. 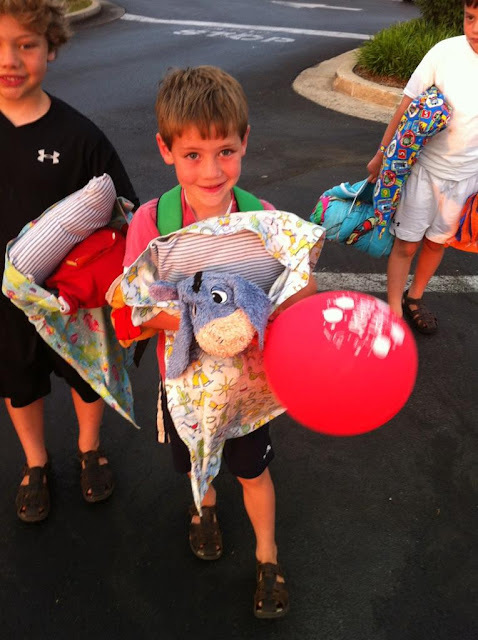 But not forgetting it was the start of Sam's birthday, Pa and the big boys hid balloons in their pillows so they could blow them up and surprise Samuel in the morning. Okay, so not everyone had a restful night sleep. At nine am, Pa didn't even make it through family Bible time. This roughing it stuff is quite exhausting! What a great, great adventure for dad and boys! Smiling at how tired the daddy was. ;-) You have raised some darling boys for them to care so much about stains in the wild. What a grand time!